Get Vendio Gallery - Now FREE! Hours 7:30 to 5:00 EST M-F till noon on Saturday. 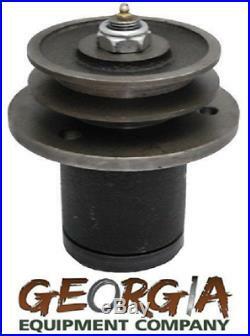 THIS IS FOR ONE REPLACEMENT NEW SPINDLE ASSEMBLY COMPLETE FOR MOST KING KUTTER AND COUNTY LINE FINISHING MOWERS. FITS RFM 48 RFM 60 AND RFM 72 KING KUTTER. COUNTY LINE MODELS MADE BY KING KUTTER & USE THIS SPINDLE. DOES NOT FIT THE RSFM 72 OR THE RSFM SS FH 84. We also carry several different parts for the finishing mowers. Thanks for looking and God Bless! Add a map to your own listings. The item "COUNTYLINE BLADE SPINDLE FOR FINISHING/GROOMING MOWERS PART #CL075" is in sale since Tuesday, December 19, 2017. This item is in the category "Business & Industrial\Heavy Equipment Attachments\Mower Decks". The seller is "gaequip" and is located in Swainsboro, Georgia. This item can be shipped to United States.